Published Aug 12, 2014 by Addison-Wesley Professional. Part of the LiveLessons series. 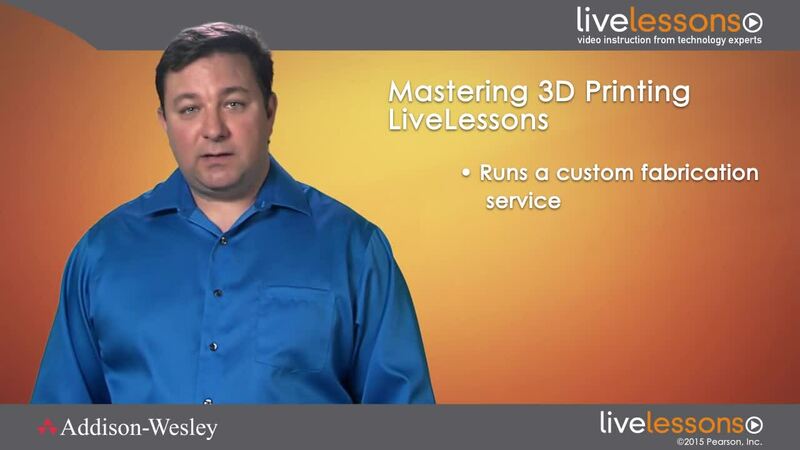 Mastering 3D Printing LiveLessons teaches the fundamentals of 3D printing, including how to design objects using free, open source 3D modeling software and use a consumer-grade desktop 3D printer to turn a 3D model into a physical object. Dave Seff is, professionally, a UNIX/Linux engineer. Beyond that, he has studied electronics, computer design, computer programming, mechanical design, and machining in both school and via self-education. He prides himself on building his own tools and machinery for the purpose of fabrication and manufacturing. He has built many CNC (Computer Numeric Controlled) machines, including three desktop 3D printers of his own design. In Lesson 1, you come to understand the difference between 3D printing and traditional manufacturing along with the pros and cons of both methods. You also learn about different 3D printing techniques used in the industry. In Lesson 2, you learn how to create basic objects for 3D printing using the same free software that creates cinematic special effects. Building on the basics from Lesson 2, in Lesson 3, you learn how to create complex objects that can be printed and used in the real world. In Lesson 4, you discover how to prepare a computer 3D object for printing on a 3D printer. In Lesson 5, you learn how to set up and operate a desktop 3D printer. By the end of this lesson, you have the knowledge to produce your own objects.